SPRING, please say it's so! The calendar says it's Spring but the view from my window says, "sweetheart you're in Canada...think again". Well Spring HAS Sprung in our living room and I was bound and determined I would decorate our Spring Mantle for under $10.00! The first thing I did was shop the home for anything with a Spring/Easter vibe. Then I headed to the dollar store with my $10.00 bill in hand. So now what? 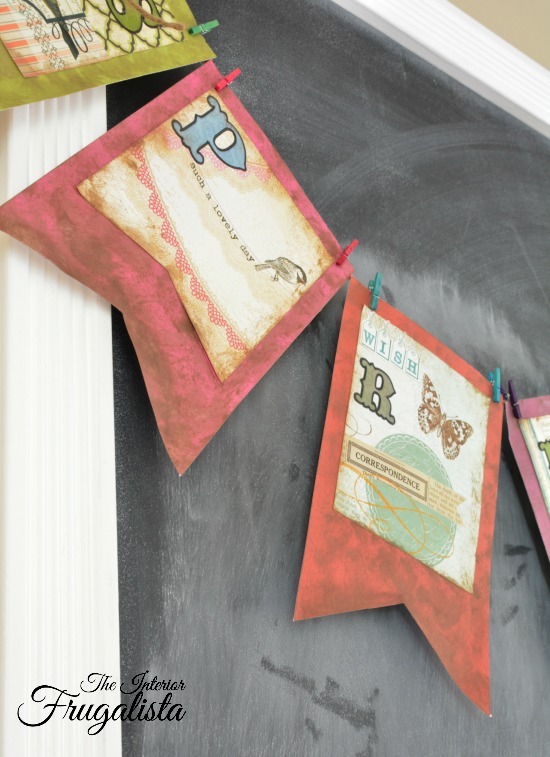 I started with the items I already had on hand like colored cardstock, scrapbook paper, alphabet stickers, twine, and some cute mini clothespins to create a simple banner. Using a ruler, I drew the first flag banner onto cardstock and cut it with a paper cutter. This became the template for the rest of the flags. Mine are 5" x 8"
I went through my scrapbook paper to find images perfect for Spring. I cut the scrapbook sheets to 4 1/2" x 5 1/2" and glued them to the front of the cardstock. I attached 1-inch self-adhesive letters to the front of each flag. They came in a booklet that I found at my local Dollarama store. The booklet also contained some cute stickers that I also used to embellish the flags. I had the cutest crochet bottle caps in my stash (got them at Michaels) to embellish the letter S flag (see below). The Alphabet Booklet also contained some cute stickers that I embellished the letter R flag with by adding the word WISH. ...and ENJOY on the letter N flag. Nothing says spring like a gazebo, right? Several weeks ago Mr. Frugalista came home with a miniature wooden gazebo that he found while thrifting on his lunch break. I gave it a good cleaning and a dry brush of white chalk paint. 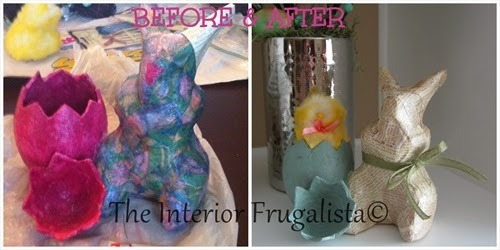 I found some raffia ribbon in my crafting stash and made a nest and filled it with Marbled Easter Eggs that the kids and I decorated around 15 years ago! ...Duck Egg Blue chalk paint! I had two of these wooden bird houses, one I gave to my Mom for her birthday and this one I kept for myself. I painted it with Simplicity White, Luscious Lime and Antique Red. I pulled a wooden candlestick from the trio in the master bedroom and thought it would make a perfect base for the birdhouse. Which brings me to my cute little bird cage. You'll see it creatively incorporated into all my seasonal vignettes. 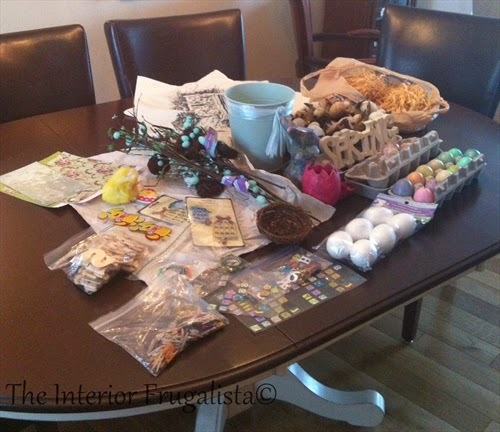 I placed the remaining marbled Easter eggs into the nest and added a few feathers I had in my craft bin. In the master bedroom, I had a set of faux Heather tea cups. I grabbed one of them to add to the display. Using some real Heather in a teacup & saucer would have been very pretty but remember I was decorating on a $10.00 budget! One of my dollar store purchases was this cute wooden letter block. I gave it a quick coat of paint using Duck Egg Blue, Antoinette, and Perfection. Last but not least is what consumed most of my budget. I had the vase on hand as well as the moss but I thought these branches with mini eggs and nests were just too adorable. 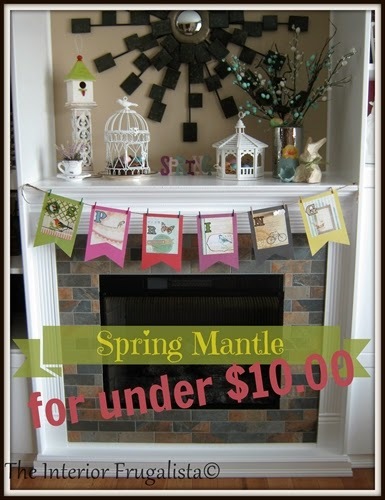 For a grand total of $9.00 and some change, there you have it...a Spring Mantel for under $10.00! To add some dimension to the Spring Banner, I aged each flag by pouncing brown paint around the edges of the flags. To do this I used a round stencil brush and dipped the ends of the bristles into the paint and dabbed the excess with a paper towel. In a circular motion, I lightly added the brown where the paper would naturally age over time (see picture below).